Just imagine . . . it's late at night on Christmas Eve and lightly snowing in Washington DC when President Obama calls for a special midnight session with Congress, while most Americans might be at home sleeping or wrapping presents. The very last thing on their minds was some newfangled international trade agreement. After all, the mainstream media (who's been busy bombarding them with Holiday commercials for weeks) has hardly even acknowledged that such pending legislation for a trade agreement had even existed. Here is exactly what Hillary Clinton told Nevada political reporter Jon Ralston in a TV interview on June 16, 2015 about fast-track (TPA), and the program for re-training displaced workers (TAA) and the Asian trade agreement (TPP). Hillary Clinton had only opposed the trade bill if it excluded the funding for re-training displaced workers (TAA). She clearly seemed to support both the TPP trade deal and fast-track, and was only taking a stand on assistance for displaced workers — which, at best, is only a mediocre program that does very little for millions of workers who lose jobs to foreign low-wage countries. Just two days before that interview, she was explaining how Obama should get fast track. Once not too long ago, only a few privileged Washington insiders (including a few members of Congress) and a whole slew of corporate lobbyists (about 500 in all who actually wrote the TPP trade bill) were the only ones who knew about this nefarious trade agreement (and Hillary Clinton) — that is, until the more enlightened among us had learned more about it from websites such as Wikileaks. But for the most part, the corporate mainstream media (such as the BIG 3 cable news channels — MSNBC, CNN and Fox News) has been all but hush-hush on the subject; whereas online, the internet is abundant with information on the topic. But imagine if it were still 1995, we might not have ever known about such a trade deal, and it might have already passed behind closed doors. I just read in an email yesterday (from an unnamed source) which hints that Congress and President Obama (who lobbied for the TPP trade agreement in front of the outsourcing and tax-dodging Nike headquarters last year) might be planning to sneak the TPP trade deal through in the lame-duck session after the November election is over — even despite the fact that public opinion is now against this nasty trade deal. Former Secretary Hillary Clinton, after promoting the TPP trade deal 45 times (while saying it was “the gold standard” of all trade deals), now says she wouldn’t support it because of what she's "learned about it” — whatever that means. What exactly did she learn? She never told us and the media never asked her. But why did she promote it and call it the gold standard before knowing what was in it? That sounds a lot like Rep. Nancy Pelsoi saying we have to pass Obamacare first, before we want to see what's in it. Obviously one would have to be pretty naive to believe that Clinton had no clue as to what was in the trade deal. Either that or, she was just a puppet for the corporate lobbyists and parroted everything they told her; in which case, neither scenario makes her qualified to be our next President. But now, evidently, Hillary Clinton doesn't agree with Obama on everything — and won't continue with all of his polices either — not if she claims that she no longer supports the trade deal (that, for some reason, Obama wants very much) if she were ever to become the next POTUS. I searched Google to find out if Obama and Congress were going to try and pass the TPP trade deal behind our backs; but other than what I've already written and read about TPP, the following is all I found — which mostly reiterates what we already know — and because the major media doesn't bring it up very often (because they favor the trade deal). March 23, 2016 — Seattle Times: "Bernie Sanders gets trade right. Residents of Washington state recognize the difference between a good trade policy and a bad trade policy. A bad trade policy is still bad, even if you call it free trade, nuanced trade or utilitarian. The Trans-Pacific Partnership is neither free, nuanced nor utilitarian. It’s an extension of the failed NAFTA model, which helped de-industrialize our manufacturing sector and eliminated millions of family-wage jobs." March 24, 2016 — Huffington Post: "The recent Washington Post piece by Vice President Biden’s former chief economist Jared Bernstein does a great job explaining why the real choice is not between TPP and no trade. As he notes, we don’t need more free trade agreements to expand trade..."
Jared Bernstein at the Washington Post: "The TPP says signatory countries must have minimum wages, but it says nothing that would prevent a country from setting its wage floor at the equivalent of one cent [and] it must be weighed against the notion of multinational companies suing governments through a tribunal that supersedes sovereign law in a system that allows no appeals ... my read of the evidence is that trade will continue to expand with or without Free Trade Agreements." March 26, 2016 — NBR: "The US will vote on TPP ratification in December or later. The trade deal needs ratification from countries representing 85% of the GDP of original signatories to come into force. Mr Trump is anti-TPP and would veto any Congressional vote in favor if he comes to power ... Senator Cruz also opposes the TPP." And here's something from Canada: "The Trans Pacific Partnership, a massive trade deal that covers 40 per cent of the world’s GDP, has mushroomed into a political hot potato in the United States. Presidential candidates Donald Trump, Hillary Clinton, and Bernie Sanders are all expressing either opposition or concern over the agreement . . .When it comes to the TPP, U.S. demands could trump Canadian's desires." But I've also noticed something very contradictory . . . some Democratic Senators will pass a trade deal that would drive up the price of prescription drugs, while also introducing legislation to stop price gauging by BIG PHARMA into a Republican-controlled congress that, not only supports the trade deal, but would also kill any such Democratic proposal. Is this (like many other congressional bills) just a political game of bait-and-switch to make it appear as though they are genuinely concerned about high drug prices, while at the same time, passing a trade deal that would effectively drive prices higher? Is it time to see who is donating to their campaigns again? It was mostly Republicans who voted to fast-track the TPP trade deal for Obama last June — 81% of all the Republicans in Congress (in both the Senate and House) voted FOR fast track and TPP. But 80% of all the Democrats in Congress (both in the Senate and House) had voted AGAINST fast track and TPP. 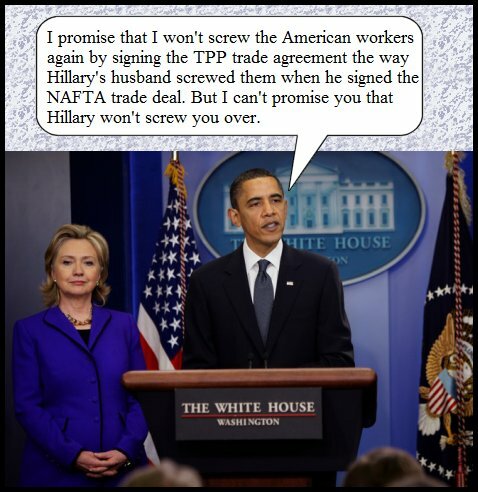 June 15, 2015 — Hillary Clinton "sort of" comes out against the TPP trade deal. June 23, 2015 — The same aforementioned senators passed fast-track for the TPP trade deal. June 25, 2015 — Senator Claire McCaskill [a Hillary surrogate who voted for TPP] said Bernie Sanders was too liberal, and had complained that the media was being too nice to him because they weren't calling him a "socialist" often enough (even though the media was ALWAYS calling him a "self-proclaimed Socialist" rather than a "democratic socialist"). February 8, 2016 — The Alliance for Retired Americans wrote: "The corporations want the [TPP] to slip through Congress under the radar. Pharmaceutical companies and their corporate allies are doing their best to ram this harmful pact through the U.S. House and Senate — telling the American people one thing, while hiding the truth. This agreement is bad for American workers and consumers, and particularly harmful for retirees. It locks in high drug prices for consumers and the government while lining the pockets of the pharmaceutical industry. TPP also contains extreme patent protections for name-brand pharmaceuticals that threaten to restrict access to cheaper lifesaving medicines in all TPP countries, including in the United States. It will make it more difficult for companies to manufacture the cheaper generic versions of drugs — leading to higher costs for everyone. When the policy makers finally revealed details of the Trans Pacific Trade (TPP) deal in November of 2015, it was clear why the talks had been kept secret for seven years. The TPP is an outsourcing deal — not a trade deal." February 23, 2016 — Senator Claire McCaskill [who voted for TPP and bashed Bernie Sanders on behalf of Hillary Clinton] announced she was diagnosed with breast cancer. March 1, 2016 — A bill was co-sponsored by Senator Claire McCaskill [who voted for TPP] to promote competition in the off-patent drug marketplace by instituting a priority-review pathway to break up off-patent drug monopolies and create an additional voucher system to create incentives for generic drugmakers to take more interest in low-margin, off-patent products ... and, if passed, would represent a substantial step in shoring up generic competition and deterring future price gouging. March 21, 2016 — Noted economist Dean Baker at the Huffington Post: The real story of the TPP is that it has little to do with trade . . . The deal is about putting in place a pro-business regulatory structure. It was largely negotiated by business trade groups who crafted a deal to boost their profits. The TPP will put into question every health, safety, and environmental regulation that governments at any level seek to implement. The assurances from the Obama administration to the contrary on this front are absolutely worthless. The TPP sets up an extra-judicial system, not bound by precedent and not subject to appeal, which can impose large fines for any measure it chooses. Former President Obama will not be pulling money out of his personal bank account to compensate anyone if his assurances prove to be wrong. But the most pernicious part of the deal is its extension of protectionism in the form of stronger and longer patent and copyright protection. This will raise the price of the protected products, most importantly prescription drugs . . . The deal is about increasing corporate profits at the expense of the public in all of the countries that are parties. March 24, 2016 — A new Bloomberg Politics national poll found that Bernie Sanders leads Hillary Clinton 49 percent to 48 percent of those who have voted, or plan to vote, in this year’s Democratic contests. March 25, 2016 — AlterNet: "Bernie Sanders rightfully pointed out on The Young Turks Wednesday night that corporate media is full of conflicts of interests. Comcast, which owns or partly owns MSNBC, NBC, Vox and Buzzfeed has a great deal invested in private health care and has lobbied hard for the Trans Pacific Partnership — both of which Sanders has railed against ... these types of corporate biases are sure to trickle down to the content in the aggregate." Here's how Senator Bernie Sanders stands on prescription drug prices. Remember, those such as Senator Senator Claire McCaskill voted for TPP, while Bernie voted against it. And with Hillary Clinton, we just don't know for sure. What she says and what she does, what she thinks and what she believes, what is true and what is not, are for her, many different things. But nothing I've found online through my Google searches has led me to an answer to my original question: Will our economically right-leaning pro-corporate "moderate" President and all his Republican allies in Congress pass the TPP trade deal behind our backs while we're all focused on the aftermath of the 2016 presidential election? Because if Obama II (Hillary Clinton) now says she doesn't support the TPP trade deal, will we all be safe if Obama and Congress doesn't pass TPP in the lame duck session? We already know for sure that the "progressive" Bernie Sanders would never pass TPP, and that's one big reason why most of the "establishment" Democrats are endorsing the "moderate" Hillary Clinton. Trillions of dollars in profits (that don't trickle down) are at stake for the big drug companies and many other multi-national mega-huge corporate conglomerates, so the pressure is on. Bernie Sanders (and maybe Donald Trump and Ted Cruz) might be the only presidents who would NOT pass this horrible trade deal — which has been described as Bill Clinton's "NAFTA on steroids". Of course, it would greatly help assuage our fears if President Obama would appear on national television, and during a White House press conference, promise the American people that he would NOT pass this nasty trade deal in the middle of the night behind our backs while we're safely snug in our beds sleeping. But if he does pass TPP, the American taxpayers should NOT build his $1 billion presidential library — not while millions of Americans still remain unemployed and devastated in the aftermath of the Great Recession. * Here's what Bernie Sander says of the corporate media — in 98 seconds. March 26, 2016: Will TPP still be part of Obama's legacy? Trade supporters and some lawmakers are eyeing a tiny window for the deal to be put to Congress. "At this point, it seems the most likely timing would be between the US general election and the inauguration of the incoming Congress, known as the 'lame-duck' session," said Boston University professor of international relations and political science William Grimes. Sometimes one chamber passes something acceptable while the other passes another version which is acceptable to most constituents....then they send chosen House and Senate members to "rectify" the two versions and instead all of the crap that corporate lobbyists wrote and was removed earlier is put back in and nothing can be done by that time because the bill was "already passed". Conferees. So even when one things they have gotten somewhere in both houses, odds are corporations will have their bill the way they wrote it passed into law anyway. Fast track probably is but if multinational corporations want something, they don't give a damn about the constitution, the idea of representative government or whatever else is in their way. Former Clinton era US Labor Secretary Robert Reich said he had always supported free trade, but that the Trans-Pacific Partnership was "atrocious". "At this point, it seems the most likely timing would be between the US general election and the inauguration of the incoming Congress, known as the 'lame-duck' session," said Boston University professor of international relations and political science William Grimes. Experts say that while the deal signed on Feb 4 cannot be altered by Congress before it is put to a vote, certain side agreements can be negotiated to make the agreement "palatable to the majority of each House before submitting the implementation legislation for a vote". Professor Grimes added that these are likely to be "face-saving measures and side deals that would benefit the constituencies of certain key legislators, giving them more reason to move through the agreement". The soonest the TPP's ratification vote may happen is during the “Lame Duck” period after November's election. Vietnam’s textiles and apparel industry will enjoy expanded access to the US and Japan markets through reduced tariff duties as a result of TPP once it has been enacted, accelerating foreign direct investment into the country.